This high back swiveling computer desk chair is great for both home and office use. With its 360-degree swivel and adjustable seat height, this piece allows you ample mobility and adaptability, while the lavishly padded arms, seat and high back guarantee your comfort. This office chair features luxurious leather for upscale look and feel and creates an environment of comfort and focus for your work space. The high back and seat are designed with comfortable padding providing total body support. Offers simple and intuitive controls such as pneumatic seat height adjustment, 360 degree swivel, tilt tension and tilt lock. Thick padded arms add to the unique appeal. 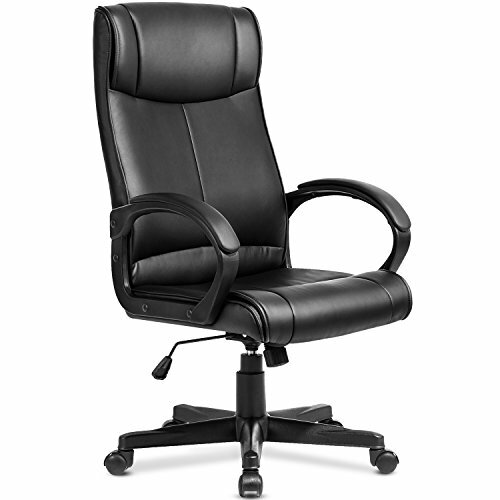 This versatile, classic chair works equally well behind an executive's desk or in a cubicle. Dimension: 23.6 inch L x 18.5 inch W x 46.1 inch H Assembly is required.